We heard today that M Chabannes died on Monday at the age of 92. We knew him and Madame slightly, they were of a previous generation – les anciens as they are affectionately known here – but our lives overlapped perhaps more than he ever realised. When we first arrived the village had three cafés, (at one time apparently there were twelve!) one of which was much more than a simple watering hole. Chez Chabannes as it was unofficially known, also operated as a restaurant, hotel, taxi and ambulance service and a petrol station and the large garaging space at the side of the building on the main street housed several full sized coaches, painted in the livery of Les Cars du Vivarais. The coaching business was begun in 1890, by the splendidly named Antoine-Frédéric Heraud, who is described as a voiturier, offering transport services of the horse and cart variety. In 1929 M Heraud acquired his first petrol-driven Berliet autocar. The war years were challenging and fraught with danger and heroism but he was able to restart his business at the Liberation and in 1947 Marc Chabannes entered his employ as a driver. In 1962 Marc and his wife Jeanine took over the business which they ran very successfully, expanding their routes and fleet and buying out smaller local companies which had run into difficulties. An early fleet of school buses. The garage is the last building on the left. In 1987, the year we bought les Sarziers, M Chabannes retired. The business continued, managed by his sons who, needing more space to run an expanding operation, had moved their headquarters to nearby St Félicien, where they live. It so chanced that when we were allocated our brand new telephone number it was, unbenownst to us, the one recently relinquished by the bus company. For the first few months we would excitedly rush to the phone – who could be calling us? – to hear a plaintive country voice at the other end asking when the next bus was to Bozas or whether the Tuesday market service was still running in spite of the snow. We were considerably puzzled and, as newcomers, at a loss to answer. It was when we were stuck behind a bus on one of our interminably winding roads and read our number clearly painted on the back that we grasped what was going on. We made sure to get hold of a comprehensive timetable, and for quite some time we operated as a reliable information service for les Cars du Vivarais! The family business continued to thrive and prosper and is now into its fourth generation. In 1990 they branched into the travel business, opening an agency under the name Voyages Chabannes, in St Félicien and in 2004 two more agencies opened, one in Tournon and the other in Valence. The company has a fleet of 40 vehicles, ranging from luxury international touring coaches to minibuses, the majority of which are manufactured by Iveco 25 miles away in Annonay. They now operate regular bus lines, school bus and factory staff services and airport transfers together with long distance group coaching holidays. It’s come a long way from M Heraud’s horse and cart! We often use their regular lines to connect with train services in the Rhone Valley, but the service we most enjoyed was the market bus on Tuesdays, which we only discovered about eight years ago. To get into town we could take the regular 9 am bus which stops at the end of our lane. For the return, M Chabannes himself would pick up passengers at twelve sharp outside the bank (a fact that you needed to know in advance otherwise you could wait for days at the official bus stop, which he had decreed was impractical, in view of the market throngs). Of course most of the handful of passengers were regulars and M Chabannes would install them in their appropriate seats in the minibus before packing away the little step he had thoughtfully provided and settling into the driving seat. He had by now been retired for some 25 years, but he loved providing this useful weekly link between Empurany, Arlebosc and the market in Lamastre. So much so that, when one autumn we discovered it had disappeared from the official timetable published by the Conseil Regional, and stopped him in the village to ask if it had really been discontinued he replied emphatically “Bien sûr que non!” The authorities can publish what they please, he said, but I will still be running my usual service! The ambiance in the market bus could be lively. He had been at school with many of the elderly ladies and chatted away animatedly with them, although he would brook no nonsense. Once in Empurany he was accosted by the driver of an enormous lorry who asked directions to an impossibly distant farm. M Chabannes gave directions, enthusiastically supported by the ladies behind him who exclaimed “oui, oui, OUI” at every juncture until it became too much for him. Turning round to us all he exclaimed “mais arrêtez de dire oui tout le temps!” He was a good friend of M Banchet who sold us our house and, when he stopped to drop us on our corner he would climb out, firmly shutting the doors on the ladies, to ask about his friend and generally have a little chat before consenting to carry them further on their way. Les Cars du Vivarais are special to us and whenever we spot one we feel a glow of familiarity and friendship. I remember once travelling on a motorway in Spain with my group of American tourists, when my bus overtook one of M Chabannes’s fleet carrying a party of pensioners from Arlebosc to the Algarve. Everybody probably thought I’d gone slightly weird as I enthusiastically waved at them all through the windscreen! On another occasion Markus was escorting a group in Budapest when he noticed a Car du Vivarais parked in the bus park. The driver was not there, but Markus left a little note under the windscreen wiper saying hello to everybody and sending best wishes for their return to the Ardèche. Some weeks later M Banchet told us that there had been great excitement upon the discovery of the note and a considerable amount of detection work necessary to determine who had written it. I think M Chabannes was touched. I suppose this is what it means to feel part of a community and links to a place even if you are technically an incomer. So as we bid adieu to M Marc Chabannes we wish his family business every success for the future: a heartening example of continuity, local enterprise and connections. The garage in Arlebosc at the turn of the century. The early days of public transport. Our next experience of marking a route was altogether a more exciting affair. We are coming to the end of the Ardéchoise – a crazy week which has seen over 16,000 cyclists descend on St Félicien for the 25th anniversary of this legendary cycle event, the largest of its kind in Europe. Participants can choose from a network of routes covering the whole department, to be completed in one to four days or just the big one day event on Saturday. Every village and dot on the map pulls out all the stops to welcome the vélomanes with decorations, refreshments and entertainment. Arlebosc is no exception. On Thursday from 7am a stalwart band of villagers, fortified with coffee, waved and cheered the three day eventers on their way. We were joined for a time by the eleven pupils from the infants school who hollered Allez! Allez! at the tops of their voices before being shepherded back to class. Many of the cyclists of course come with family members, who spend the week in campsites and gites, and Damien of the St Félicien Tourist Office decided that something should be laid on for these accompagnants. He devised three walking routes, to run on consecutive days, with a lunch stop at one of the local farm producers. Thursday’s hike took them from the sleepy village of Bozas to Arlebosc, with a stop at Melodie and Johan’s farm for lunch and back to St Félicien, a distance of 18km. The idea is to get these people out and about, to discover our beautiful and varied landscapes, meet the locals and taste all the wonderful artisan produce. Of course this sort of thing is right up our street and we enthusiastically volunteered to help. So the day before our little group set out to mark the route. We were perhaps not very efficient: we stopped for lunch at the café, poked around the hidden alleys and secret gardens, stopped again for coffee with a friend and generally dawdled and chattered, but we got the job done and had a delightful time. The next day we were at les Blanchettes in time to set up the tables and get ready for the hungry walkers to arrive. After a glass of water everyone was ready to sit down and enjoy Melodie’s home produced lunch. On the menu was goat pâté, followed by goat merguez sausages with tabbouleh, then goat cheese and goat’s milk yoghurt. A full-on goat experience! There were armfuls of cherries freshly picked from her father-in-law’s trees and to drink, her own fruit juice, Free Mousse beer from St Victor and coffee. The weather has been very iffy over the week but each day the hikers were able to dodge the downpours. There were 78, 35 and 65 walkers respectively and lots of great feedback. We are already looking forward to next year, and so is Missy the dog, who behaved beautifully throughout. 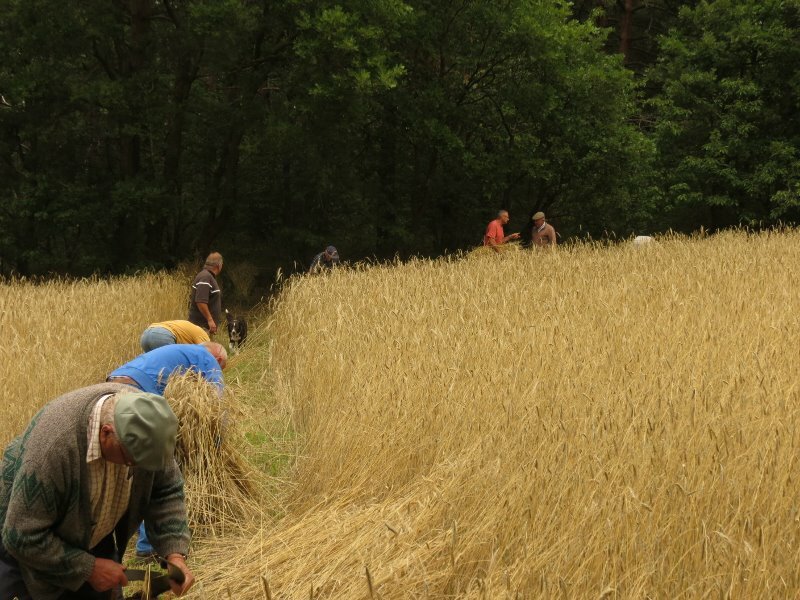 On Sunday we were asked to join a group of Arlebossiens and others, who don’t know the village, to test out the new parcous d’interprétation, ahead of its official inauguration in the summer. We are thrilled that Arlebosc is to have its very own discovery route, which has been put together by our friends Elena, who wrote the texts, and Helène at Cairn Interprétation. As you can see from their website, Cairn have created some stunning and original routes, one of our favourites is the Daronne Gorge, not far from here. Everyone gathered at the Mairie on an unfortunately cold and drizzly afternoon to be given our instructions and divided into groups to test different parts of the route. With our neighbours Brice and Lisa we set off for the hamlets of St Just and les Fauries and were rewarded with stunning views of the spring countryside. Although we know the area so well and have written our own hiking routes for Walksweeks, it’s fun to get another angle and there is always something new to discover. The parcours works like a treasure hunt, giving you clues to find illustrated cards (temporarily housed in Tupperware boxes but later in specially designed letter boxes accessible by secret code or in geocaches). Each card fills you in on the history, culture and environment of the village using three major themes: agriculture, religion and the different châteaux. On our return to base we were asked to complete a questionnaire covering everything from our general impressions of the route to typos and the quality of the information and graphics. It was a very convivial event and there was a great deal of enthusiasm and praise for all the hard work which has gone into the project over the past three years. The other big news is the re opening of the village café/restaurant after a complete renovation and under new management. We dropped in for lunch on Monday, having totally run out of provisions, and were very impressed. The menu du jour was crudités followed by local specialities: caillette, served with artisan ravioles. There was then a choice of cheese, (either a selection or fromage blanc à la crème or with fruit coulis) or to go for one of the home made desserts: chocolate mousse, tiramisù or a royal or tropézienne cake. The quality of both the ingredients and preparation was really excellent: the caillette was cooked in a marchand de vin sauce – a novel idea and very successful, and the chocolate mousse was utterly delicious. With a carafe of wine the bill came to 15 euros per person. Pretty unbeatable value! We and all the village wish the best of luck to Olivier and Sandrine in their new venture and we shall be back soon for sure. Arlebosc is full of surprises. Who would have guessed that we have an internationally renowned artist in our midst! 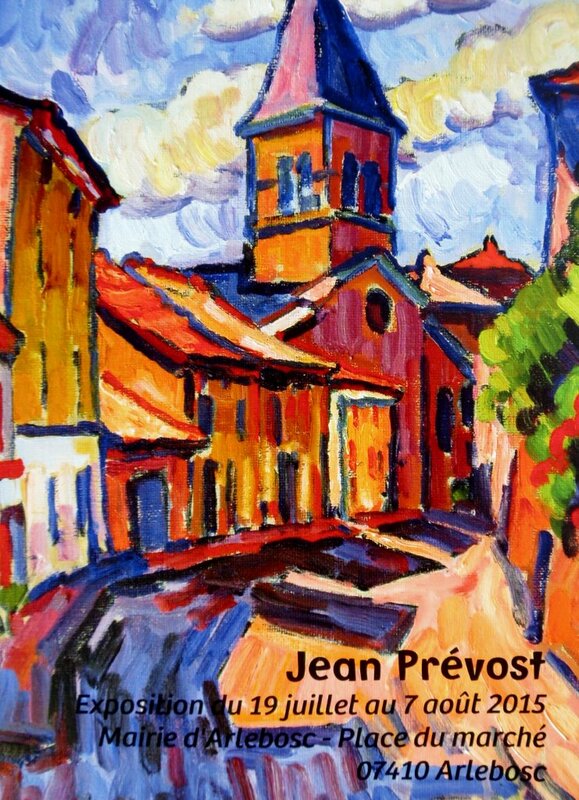 Jean Prévost divides his time between Paris, where he has his studio, and his summer residence here. This year he has put on a terrific exhibition of recent works, mostly local scenes and views of Arlebosc and neighbouring villages. We really like his style and treatments and it was a pleasure to meet him and discuss how he approaches his subjects. You probably won’t be passing before the show closes in August, but you can click here to get an idea of his work from last year’s exhibition in the Drôme, and here for his official website. Or catch him in Paris at the Salon d’Automne. For the sixth year running, Arlebosc has held its most ambitious event of the year and once again, despite the awful weather we have had this summer, the sun shone all day. The choice of date is a clever move, the last Sunday in August, just before la Rentrée when everyone is back at home, ready for school to start and looking for a family outing to round off the summer holidays. 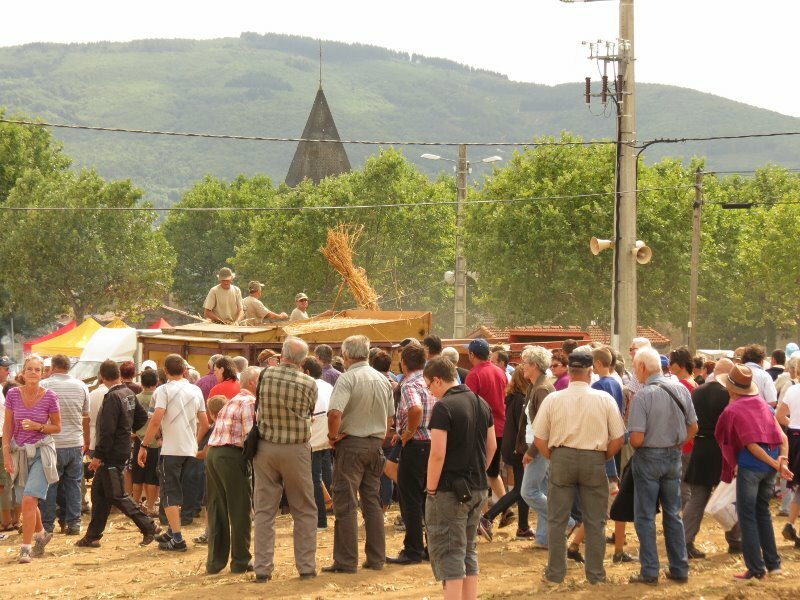 The event has become the biggest local draw for fanciers of vintage agricultural machinery and Sunday’s procession of more than 20 tractors through the village – eloquently described as une pétarade – preceded by the combined brass bands of two neighbouring villages, was definitely a highlight. Markus had been designated official photographer and was on hand and snapping away all day, from the open air Mass which kicked off the festivities to the piglet race at the end of the afternoon. 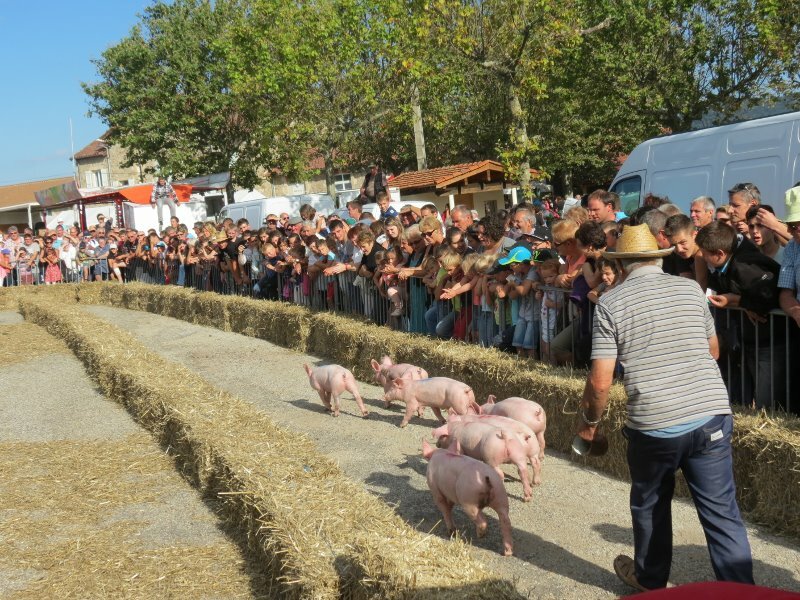 The Reboule is a traditional celebration to mark the end of the harvest and its revival in Arlebosc has proved tremendously successful, drawing an impressive crowd. 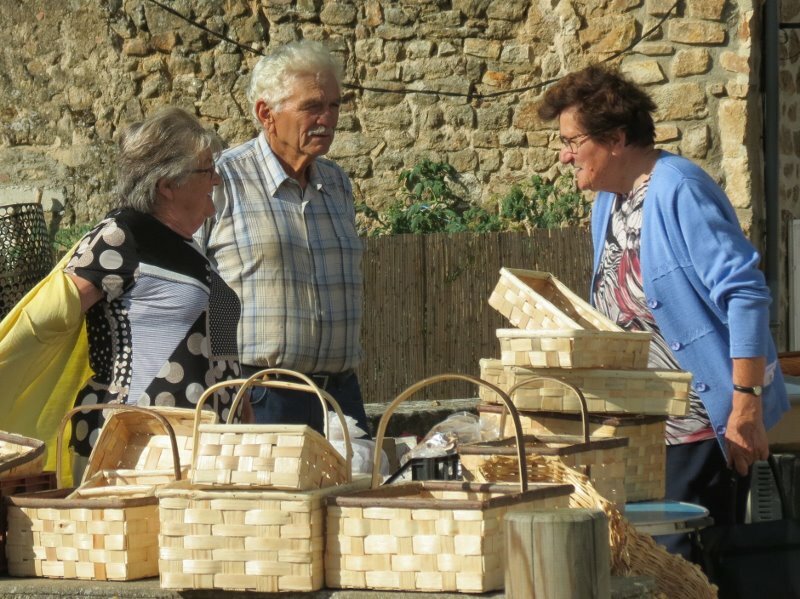 There was a really good brocante plus handcrafts of all kinds for sale, including Fernand’s handmade Ardéchois baskets. There was an excellent photo exhibition at the Mairie, a tethered hot air balloon, candy floss, a roundabout, pony rides and a wonderful selection of wooden board games of the shove ha’penny variety for the children. 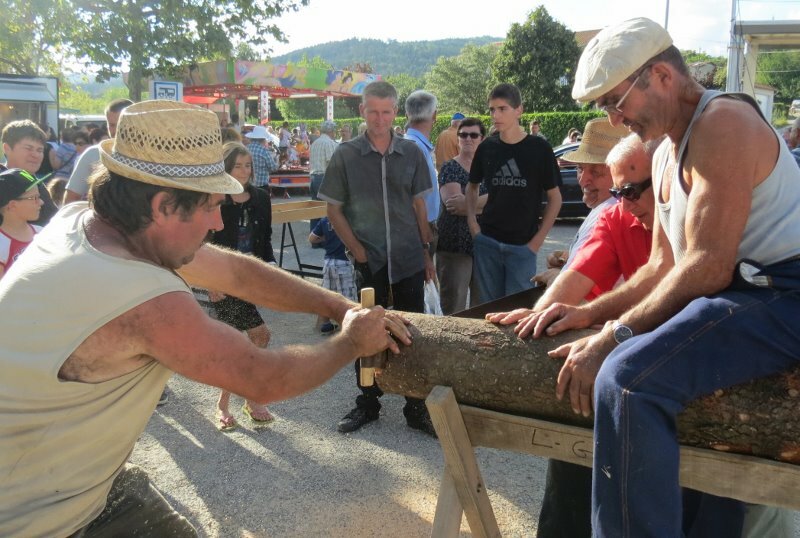 As the afternoon wore on the two-handed sawing contest became increasingly animated and impressive. The barbecue had been going since early morning and we heard later that over 800 lunches were served. Very good they were too with jambonnette to start with, tomato salad, grilled pork, frites, local cheese and a home grown peach for dessert. There was music and line dancing and the buvette did a roaring trade all day. But undoubtedly the main attractions were of the strictly agricultural kind. Along with the tractors were exhibited a huge variety of inscrutable items of machinery for winnowing, cutting hay, twisting rope, sawing or apparently for simply puffing away importantly. Several vitage cars were on show including a couple of beautiful black Traction Avants. After lunch the tractors were hitched up to an assortment of ancient ploughs whilst enthusiastic teams guided the plough shares, an event to which the photos hardly do justice, since it is very athletic and requires a good sense of balance and a certain amount of daring. 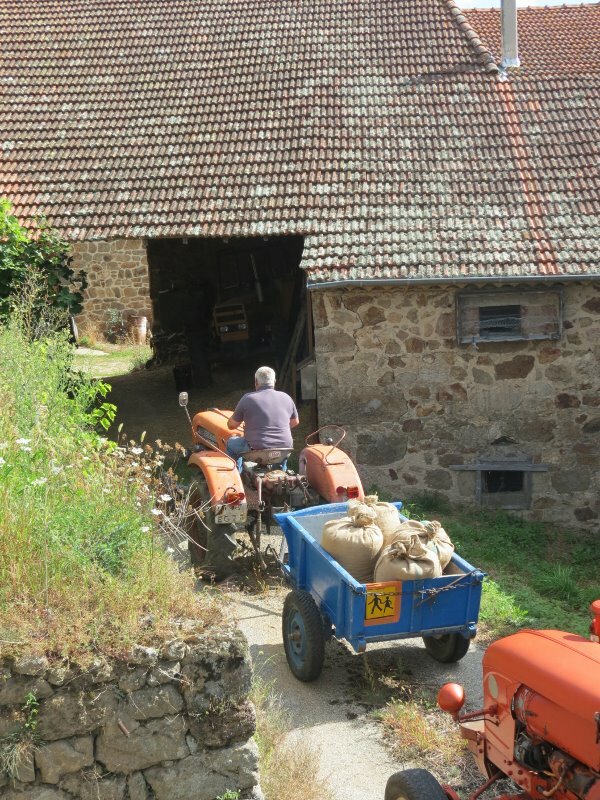 And all through the afternoon, Roger’s wheat, which we had seen cut and bound in the field above our courtyard, was being threshed using this hundred year old belt driven threshing machine called Albertine. 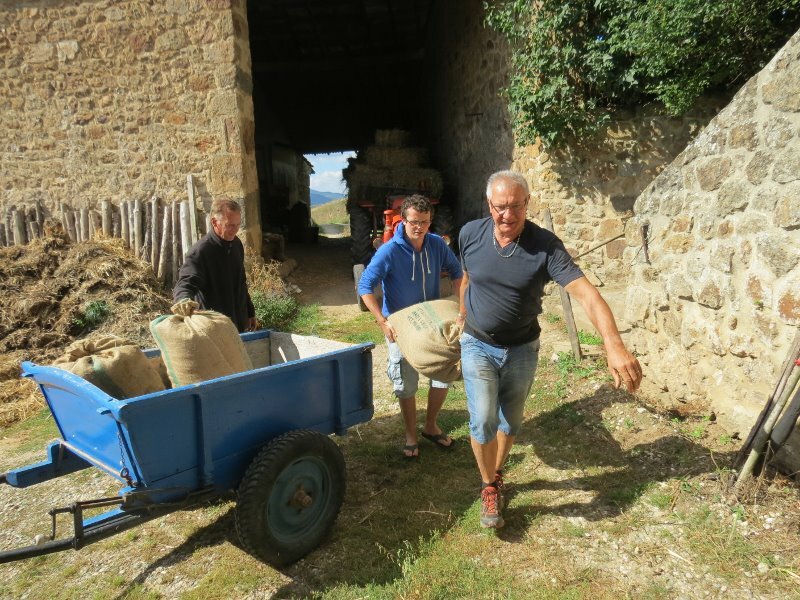 The following morning the sacks of grain and bales of straw were brought up to be stored in Roger’s barn, bringing the cycle to a close. Poor Roger is in desperate need of a hip replacement operation, but is stubbornly soldiering on using crutches. 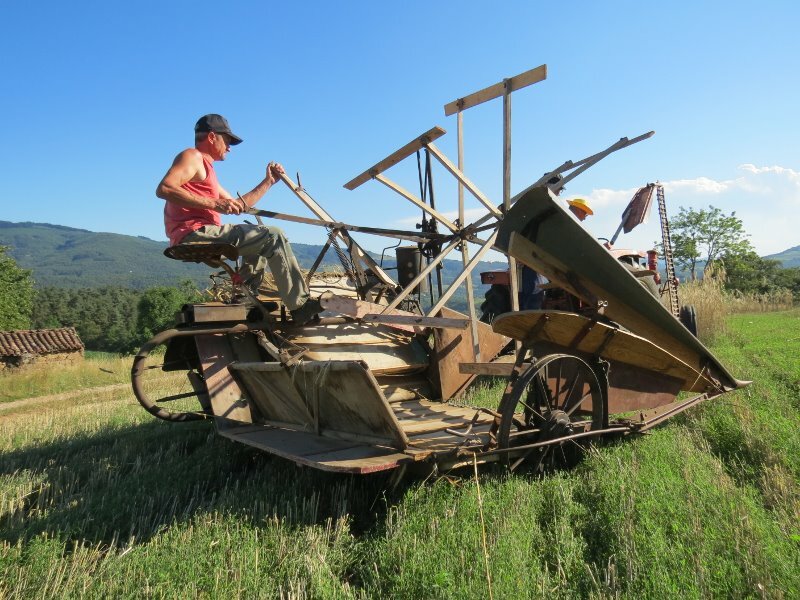 He cannot drive his tractor at the moment and who knows what the outcome will be, but for this season at least a solution has been found for his wheat harvest combining a popular event, a celebration and the traditional rural solidarity which still operates in an unobtrusive but satisfyingly effective way. Readers are probably wondering what happened on Monday . . . .
A hopeful delegation showed up, with the venerable binder and tractor combo, but the general opinion was that the wheat was too wet, there having been some heavy showers overnight which incidentally had also dampened the 14th July festivities and fireworks. They did find a bottle of rosé which had been forgotten on the previous occasion and everyone consoled themselves with that. Now the temperature is back up where it should be, at 30C and yesterday evening everyone returned in full force. The 80 year old binder behaved beautifully, unlike last year, and the job was done in a couple of good humoured hours. The pictures can speak for themselves. 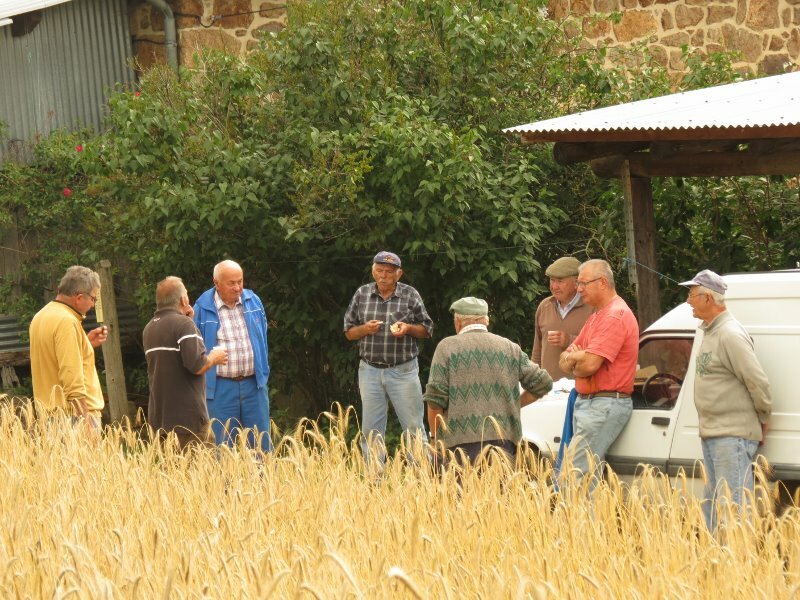 For the past few years Arlebosc has organised a Fête de la Reboule at the end of the summer, which has proved to be a great success, in spite of the nay-sayers who were of the opinion that no one would want to come and look at old tractors and steam-driven agricultural machinery. In fact it draws crowds of people to watch the rope making machine, the ploughing contest, the tug of war and the sawing challenge along with more traditional attractions, ranging from coconut shies and white elephant stalls to the immensly popular piglet race. The day starts with an open air mass, then the ancient tractors and vintage cars puff and gasp their way through the village and back. After that there is of course lunch, and the ploughing and threshing starts in earnest in the afternoon. It would be easy to see this as simply a nostalgic look back to how things once were. But this morning we were able to catch one of the unsung and truly authentic moments which go into the preparation for the event. We glanced out of our bedroom window to see half a dozen chaps armed with scythes in Roger’s wheat patch above our courtyard wall. Popping out to see what was going on we caught them just finishing stooking up the first cut. We offered them coffee, but it was already far too late for that, so we and Roger joined in their mid morning snack of saucisson, goats’ cheese, bread and un petit coup. Then everyone headed off to another little patch of wheat hidden amongst the apricot trees, where Firmin, Fernand and Louis expertly scythed around the edge of the field and cut an opening for the tractor to pass through. 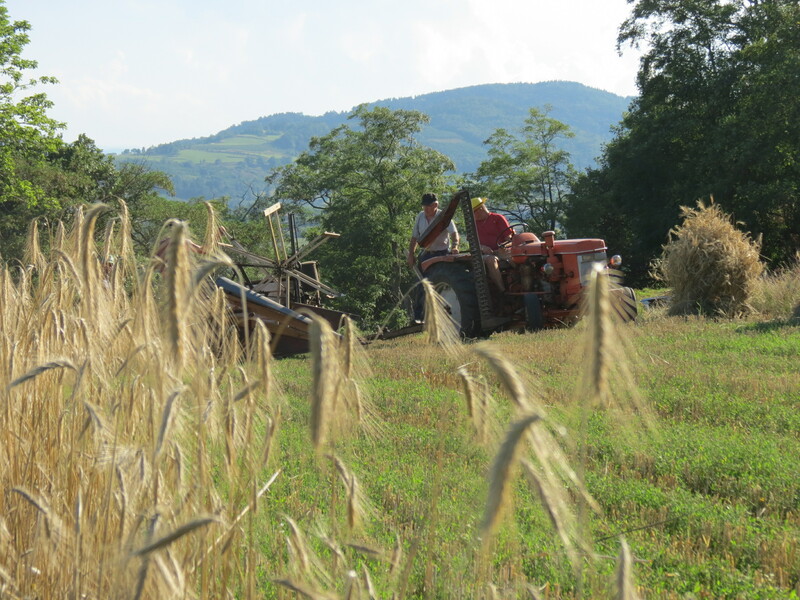 Their scythes are different from those used to cut hay as they have a metal contraption attached which bunches up the cut stalks, making it easier for the reapers to bind up the swathes. Markus was given a lesson in the correct way to do the binding, which is pretty nifty. Then the swathes were collected, piled into stooks and left to dry out. It was a lovely convivial occasion and entirely spontaneous. 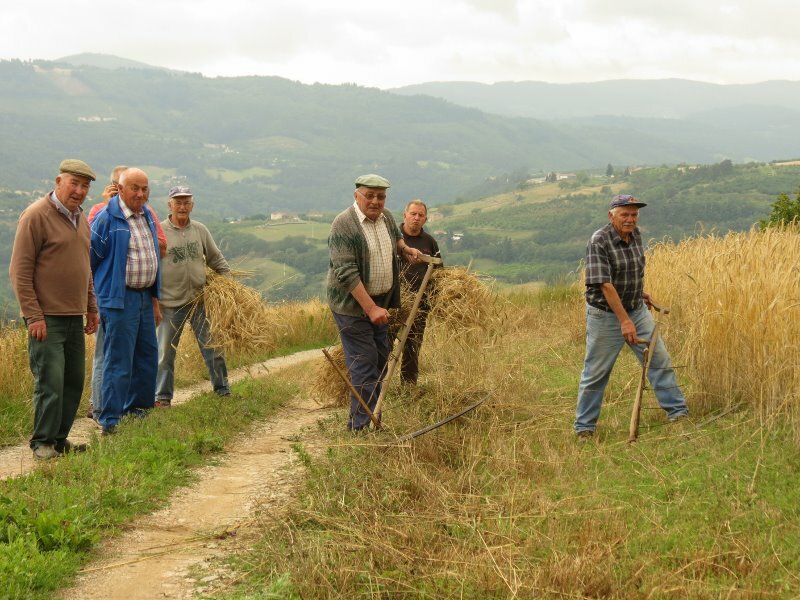 The thing which struck us most was the atmosphere between the men, working together in a traditional rural task. The older ones are farmers born and bred who worked like this for most of their lives and they are clearly pleased that there is a genuine interest in their skills and know-how. But the younger ones too have lived here all their lives and although they may be artisans or work elsewhere, they have a real understanding of the rural traditions. 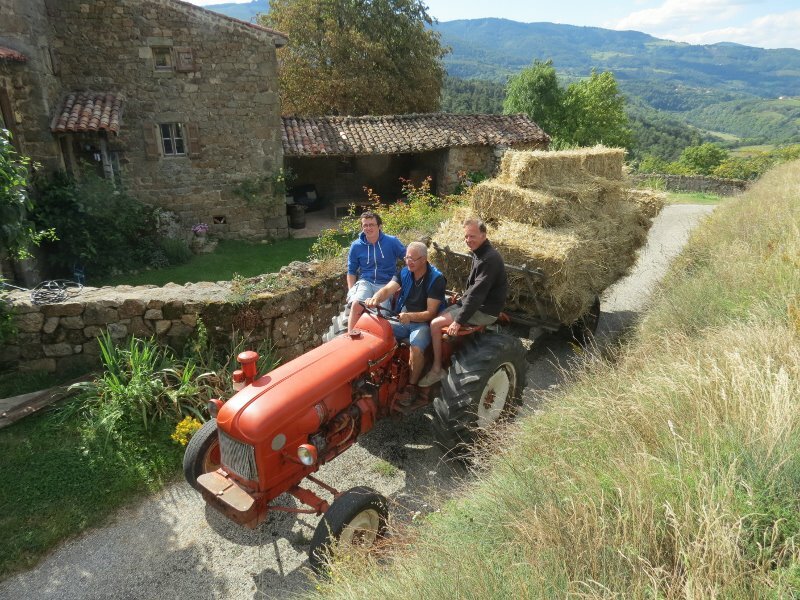 We were reminded of the harvests we used to join in with in a tiny North Ardèche village in the 1970s: the cheerful bantering atmosphere was exactly the same. It is really nice to know that the fête in late August, although it may appear to be no more than a nostalgic nod to the past, has at its roots an on-going tradition. 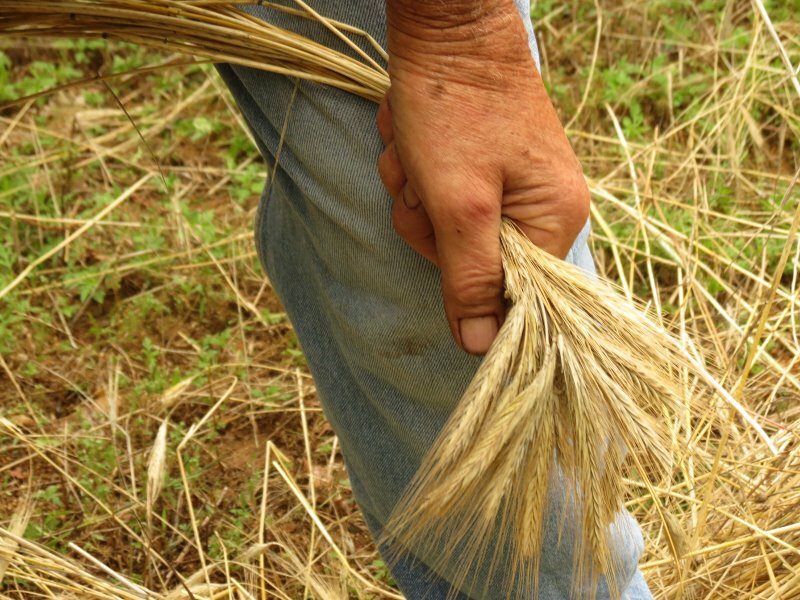 La Reboule, a local dialect word, clebrated the harvest and a successful end to the season’s labours. A celebration indeed if you consider how many disasters might befall a crop during its months growing in the field and the dire consequences of a bad harvest to a self-sufficient community. The weather has been unseasonally wet over the past ten days and this was the first moment they have had to open up the field. On Monday they will be back with a vintage tractor and binder to reap the rest. Watch this space! Some years ago, Markus inherited his godfather’s photo archive. Adrian Stückelberger worked as a professional photographer for the Basel chemical industry. From the late 1950’s to the early 2000’s he also travelled widely and enjoyed taking what he called holiday snaps. 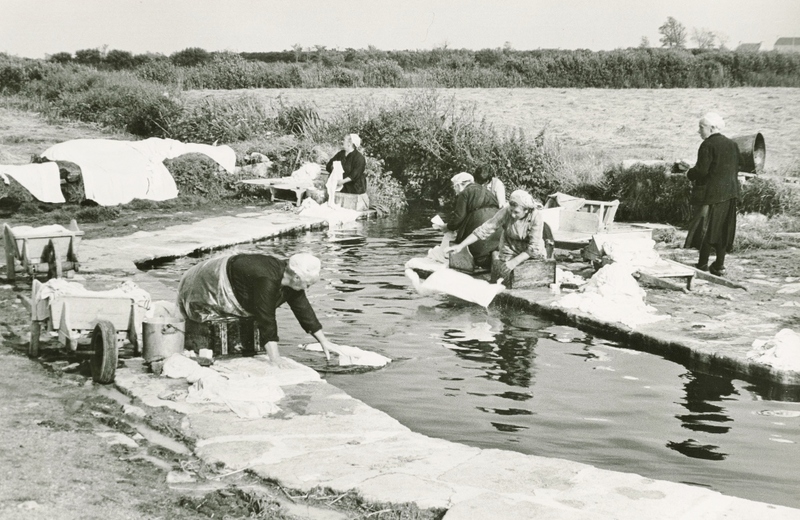 These pictures of women doing their laundry – which they have brought down in wheelbarrows – were taken in Brittany in 1958. It seems like a distant world, but it is one that I remember very well from travelling through France in the 50’s and 60’s. In fact the use of the lavoir faded away so gradually that it was only in the late 70’s that I realised that the tradition had gone for ever. In most French villages you will find a lavoir, either carefully restored or left empty of water and in ruins. They generally consist of two or three basins surrounded by a wide rim sloping towards the centre, to facilitate scrubbing. Running spring water enters and leaves the basins separately so that one can be used for washing and the other for rinsing the laundry. 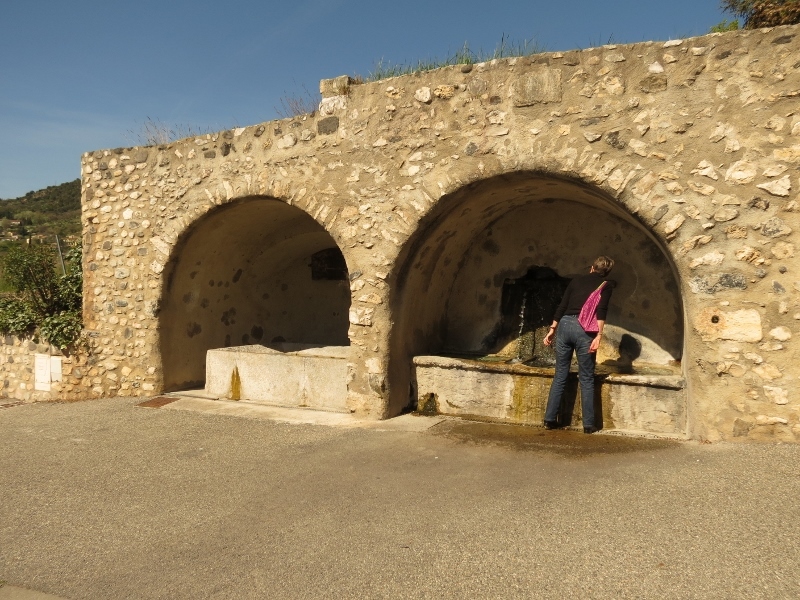 We wondered why there was apparently no lavoir in Arlebosc, until we learned that the construction was about 500 yards below the village. We found the place, in a fairly precipitous valley, below a road bridge that crosses a small stream. 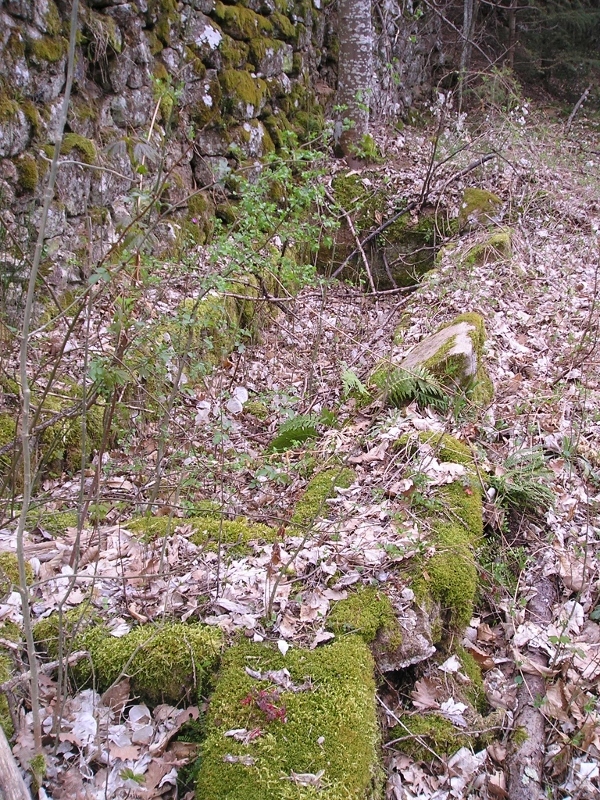 There is not much left of it – vegetation having taken over. But there was a road, and there was water, even in a dry summer. Our neighbour remembers how all the washing would be loaded up on a cart and taken down to the lavoir. Previously the family linen had been covered with ash and left out on the grass overnight so that the dew could do the pre-wash by next morning. (The idea of using wood ash on white linen seems surprising until you recall that phosphates are still used as a water softening agent in many modern laundry detergents). 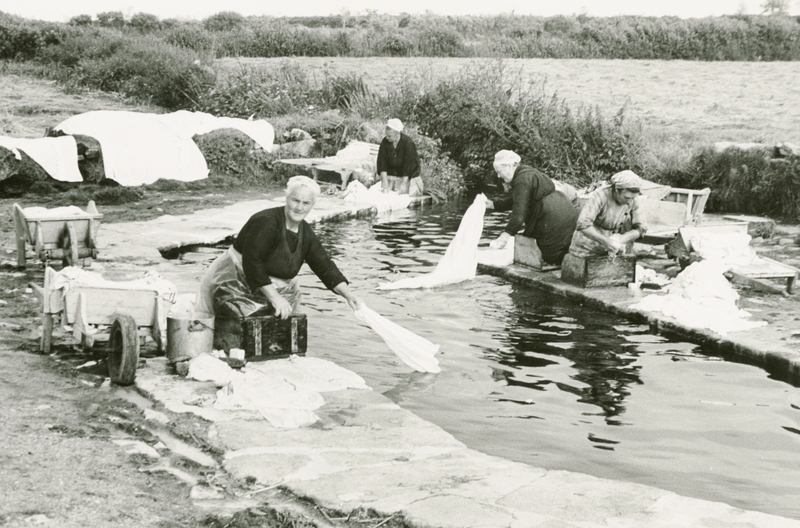 Laundering was hard work in those days. The linen was bashed and scrubbed with a hard brush and a hefty cake of savon de Marseille, then wrung out, rinsed and wrung again several times in the fresh water. A fairly pleasant task on a hot summer’s day, but in the winter months it must have been tough, kneeling on the cold stones and plunging up to the elbows in freezing water. However wash day was a convivial occasion when the women, ordinarily confined to their busy lives at home overseeing the farmhouse, kitchen and barnyard together with looking after numerous children, could get together to gossip, laugh and exchange news. 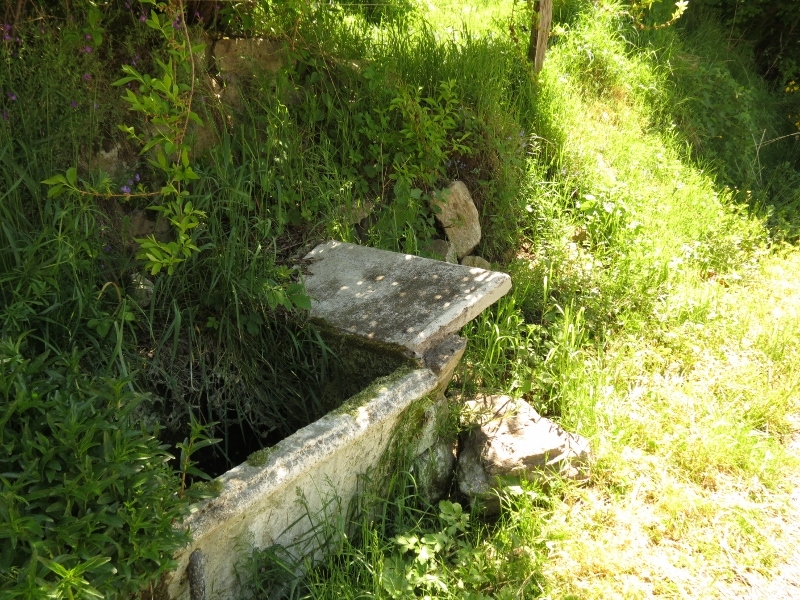 Since the Ardèche hamlets are so widely scattered, many farms had their own mini-lavoir. One of the most impressive is at les Blaches, a neighbouring abandoned farm in the woods just below us. As the years passed we were sad to see the structure crumble and eventually collapse, so we were delighted when the house was sold last year and saved from total ruin. We recently met the new owners, who are planning to restore the lavoir, as the spring nearby is still running. This is how it looks now. Watch this space for news of the restoration of a crucial part of our rural heritage.